Hong Kong airline company, Cathay Pacific are currently offering discounts and a purchase with purchase promotion as part of their in-flight magazine promo. This offer features a Men’s Arbutus Wall Street Collection luxury watch. This is a successful and effective way of using a magazine promo to increase the sales of high end and high quality products. 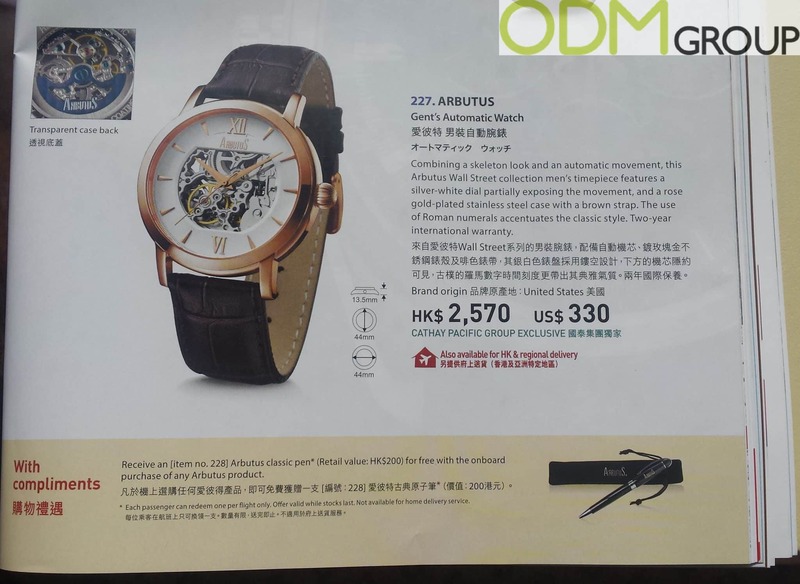 This high end product is currently featured as a Cathay Pacific Group Exclusive promotion which can be purchased for the price of HK$ 2,570 OR US$330. This luxury branded watch has a skeleton look featuring a classic style with it’s use of Roman numerals, a perfect magazine promo idea for brands whose customers like to purchase high end products. As an added bonus in their magazine promo, Cathay Pacific are also adding in a purchase with purchase complimentary gift. With each on-board purchase of an Arbutus product, you will receive an Arbutus classic pen with an actual Retail value of HK$200. This is an effective way of promoting an incentive to make customers more inclined to buy a particular product. Why is this magazine promo effective in marketing? Brand Awareness and Exposure. Effective magazine promo’s are great in targeting customers as they provide high brand exposure. This magazine promo provides an on-flight promotion, and is good for targeting passengers especially potentials customers flying in first and business class. Also customers usually read these magazines to pass time on the flight, and therefore will be aware of your brand when they read. Added value. Magazines promo’s can easily increase the value of a product. In this case offering a discounted luxury watch with a free complimentary pen worth HK$200 will make the product more appealing to purchase. Justification. By offering an expensive luxury item alongside a gift with purchase, the customer is more likely to buy the product and feel like they have gotten something valuable from it. At ODM we have significant experience in product design, sourcing and manufacturing. We can help you with your marketing budgets effectively. Be sure to contact us if you are interested in finding out more information about effective magazine promotions. If you are eager to find out more about magazine promotions, check out the blogs below for more information.